The Center for Adult and Continuing Education staff understands the unique needs of non-traditional students and makes your goals their first priority. 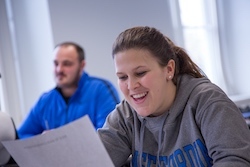 You will discover that continuing education students at Misericordia make up approximately 40% percent of the total student body, bringing an atmosphere of maturity and commitment to the classroom. 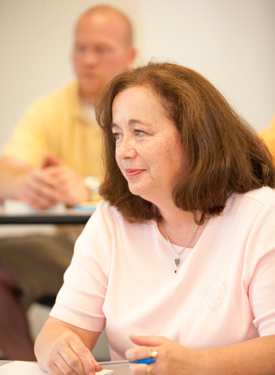 Misericordia's ARCH Programs for Adult Learners are designed for you, the nontraditional student. You can choose from night, day and weekend schedules, all intended to mesh with your work and family obligations. Click here to get information on the available part-time undergraduate majors and programs. Evening classes meet off-campus at LCCC Nanticoke each Tuesday of the session. Semesters are divided into either three sessions, each running five weeks for face-to-face classes; or two sessions, each running 7 1/2 weeks for online classes. Accelerated courses are offered in the fall, spring, and summer semesters. Students may take up to four 3-credit classes in a semester. Click here for our ARCH Accelerated program. Classes meet seven Saturdays and Sundays on alternate weekends. Or, classes meet every third Saturday morning for the full semester. Participate in class discussions at a time most convenient for you—with online classes that have been ranked nationally in the areas of student engagement and assessment. Online classes are offered in both half- and full-semester formats. Click here for our ARCH Online program. Classes meet one evening per week. Classes meet during the day and evening. For information about Misericordia's Veteran Services including the Yellow Ribbon program, click here.